Spring is upon us, and what better way to start celebrating some warmer weather than with the bright flavor of Meyer lemons? Meyer lemons have a sweeter flavor and less of a puckering sourness than your everyday lemons. They also look different with their darker, more orange color. If you were to cross a lemon and a mandarin orange, I imagine it would taste like a Meyer lemon! The tricky thing about Meyer lemons is that they are seasonal, unlike regular lemons. Be on the lookout for these gems in late winter and spring, and when you see them, bake some Meyer lemon macarons! Macarons made with the Italian method has proven to be successful for me. I still haven’t had any luck with the French method! This is very similar to the recipe I posted for Strawberry Macarons I posted earlier, but without the freeze-dried fruits, and a Swiss meringue buttercream filling instead of a white chocolate one. One of the hardest steps in macaron-making is waiting to eat them. The flavors really develop when they sit in the refrigerator for at least one night. When I bit into a freshly-made Meyer lemon macaron, I couldn’t really taste much of anything. I was a little puzzled because when I tasted the buttercream alone, the Meyer lemon flavor really shined. However, when I checked back on the macarons the next day, I was shocked at how lemony and bright they tasted! In a food processor, pulse the powdered sugar and almond flour until you have a fine powder. Sift through a sieve into a large bowl and set aside. Note: this large bowl will eventually hold all of the ingredients. In a small bowl place 55g egg whites and food coloring (if using, and to your liking). Mix together until well combined. Combine the egg whites over the sieved almond/sugar. This will create a thick paste. Place the remaining 55g egg whites and salt into the bowl of a stand mixer. Set aside while preparing the sugar syrup. In a small saucepan combine the granulated sugar with water and place on medium heat. Using a candy thermometer measure syrup temperature. When it reaches 230F (112C) start whipping the egg whites until the whites are foamy and frothy. When the syrup reaches 244F (118C) pour it over the whipped egg whites in a steady stream, while mixing continuously. Continue beating on high until the bowl has cooled slightly, and glossy stiff peaks have formed. Note: Your peaks will probably be a little floppy, which is perfect. Add the next third of the whipped whites, folding them in quickly and gently. When no traces of whites remain, gently fold in the final third. Zest and juice the Meyer lemon, set aside. In stand mixer bowl, combine the egg whites and sugar. Switch the whisk attachment for a paddle attachment. With the mixer on medium speed, add the butter, one tablespoon at a time, beating well after each addition. Fold in the salt, Meyer lemon zest, and juice. Pair up similar size and shape shells/cookies before piping on the buttercream. Tip: For each pair, flip one cookie upside-down so you know which cookies are paired and which ones to pipe. Pipe as much or as little buttercream as you like, being mindful that when sandwiching the buttercream, oozing may occur. 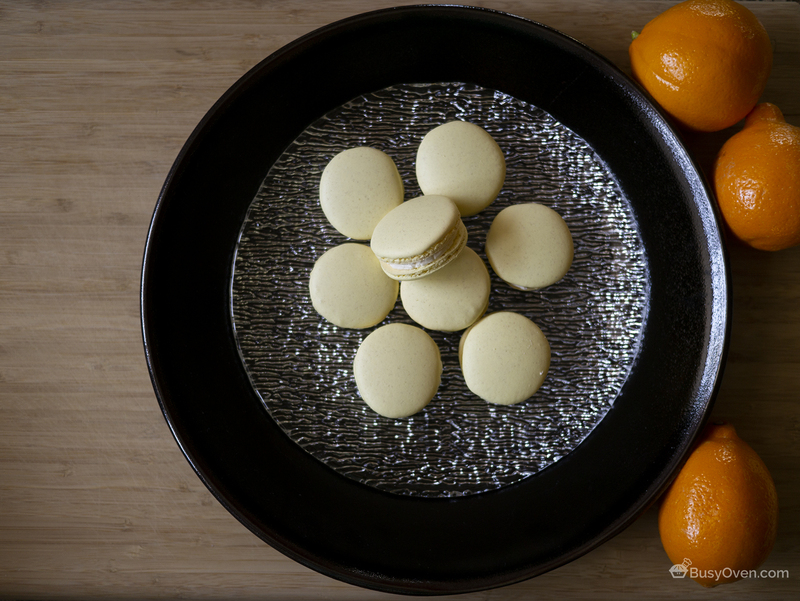 Refrigerate the assembled Meyer lemon macarons at least one night for the flavor to develop into the cookies.